User interaction and retention is one tough job webmasters, site owners, bloggers and marketers has to face. To make all things work properly, you have to think out of the box and to adopt or invent new ways of gathering traffic to your website and then make them stick to your website for any reason. In order to make all these things happen, gamifying your website is also a good option. While not new in the market, gamifying any website is still one the best tricks to capture and hold your website traffic. So, are you in to gamify your website? Video games are ingrained in our culture. Driven by some of the most innovative minds in the tech sector, our industry’s unprecedented leaps in software and hardware engages and inspires our diverse global audience. OK, so it’s important to take note of that statistic since it means that nearly half of all people are already well-acquainted with gameplay. If you drill down even further into the ESA’s research, you’ll find more information on who exactly these game players are. For example, the average gamer’s age is 35 and there’s a fairly even split between the sexes (56% male, 44% female). How To Gamify Your Website? 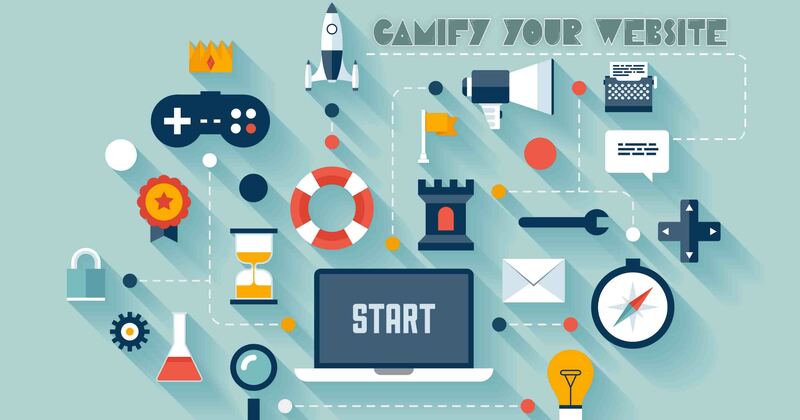 Gamification can be fun, educational, drive loyalty, boost brand recognition, and do a whole lot more for a WordPress website. It’s just important not to overdo it. Gamification needs to be memorable for the value it adds, and not just because you created a diversion someone can use for a couple minutes before getting back to work. With that said, let’s talk about some practical ways you can add gamification features to your own website. One of the benefits in playing videos games is the opportunity to meet like-minded individuals as they explore the same landscape and universe as you. Some games even allow you to join forces and form your own virtual team, despite never having met one another in real life. If your website has a large community that would benefit from collaboration and communication, forming a membership service and community would be a great way to encourage that same team-like atmosphere. If you’re interested in creating a community, check out BuddyPress, a free social networking plugin for WordPress. With the right animation, you can keep visitors engaged as they wait for a page to load. Those same type of transitional animations work really well for gamification. Obviously, no one wants to sit and wait for a game (or website) to buffer, but with a short and entertaining enough animation, you may increase the likelihood that visitors stick around longer. Check out PACE for free automatic page load process bar themes. Further building on that idea of creating a community, if you want to take it an extra step and reward members with points, you can use a plugin like myCRED to do so. For the most part, this plugin focuses on helping users devise points systems and manage visitors’ points accumulation on their WordPress website. Purchase rewards, badges, games, and other related features are available through this tool as well. Most video games will usually give you a quick overview of how to use the controller in order to navigate your way through the game. Think of tooltips in the same way. While your goal should always be to create an intuitive pathway from entry to conversion, sometimes it’s helpful to add quick tips to keep your visitors moving along. Now, if what you’re looking for is a wholly comprehensive membership rewards gamification tool, then Captain Up is what you’ll want. This tool comes chock-full of gamification features like badges, levels, trophies, points, currencies, and rewards. You can also use this to manage communication with your community and to promote and reward visitors for engaging with your brand on social media. Want to follow in the footsteps of websites like BuzzFeed and provide visitors with additional entertainment or educational value? Create quizzes, polls, and surveys to keep them engaged and give you an opportunity to gain additional insights about what more they’d like to see from you. Check out Opinion Stage’s 4-in-1 plugin solution for this.